The rise of the digital economy has changed the way businesses deliver services, interact with clients and market their products. As social networks have become an important component of our daily lives, asset managers and investment firms need to have a clear online strategy in order to stay in the game. 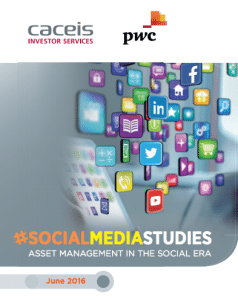 In a new report, PwC Luxembourg and CACEIS explore the state of asset management’s use of social media and the leading players in this area. The document, the second paper of the series #SocialMediaStudies, aims at highlighting the growing importance of social media in the industry. “Three years on, social media usage in our industry has evolved rapidly, and the factors driving that change have also intensified,” Joe Saliba, CACEIS Deputy Chief Executive Officer, said in a media statement. Since the previous study in 2013, asset managers have increased their presence on social media, increasing thus their interactions with clients and followers. The report, entitled ‘Asset Management in the social era,’ suggests that social media continues to thrive and is now a global phenomenon in all countries. Today, the total number of active users exceeds 2.3 billion, representing over 30% of the global population. Facebook is the leader in the field with 1.6 billion of active accounts in 2015. The giant is followed by YouTube with over 1 billion users, LinkedIn with 414 million, and Twitter with 305 million. Social media channels have been gradually integrated into companies’ marketing mix paradigms and the share of marketing budgets spent on social media is expected to more than double over the next five years, the document claims. Corporates are increasing their presence on social media, a trend fuelled by changing customer expectations, notably among younger generations. 62% of millennials say that if a brand engages with them on social media, they are more likely to become loyal customers. Moreover, 33% of them rely mainly on blogs to get informed on purchase decisions. Since 2013, the presence of asset managers on social media has increased consistently. Asset managers are using these channels as instruments to enhance brand and reputation, as well as to provide information and support to a diversified array of interlocutors, the report says. 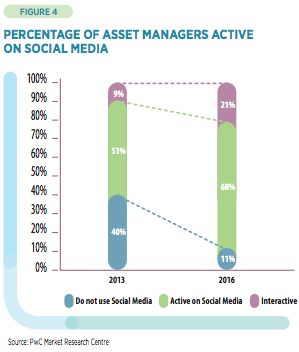 It suggests that 89% of asset managers are present on social media today, up from 60% in 2013. Moreover, the use of social media has increased significantly within the hedge fund industry in recent years. 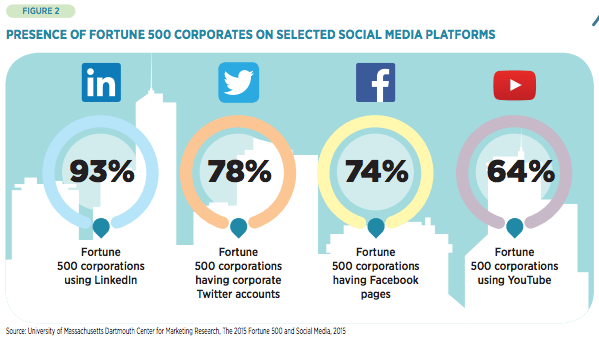 Today, 90% of hedge funds are using social media. “Social media is also becoming an important source of information for institutional investors. They are increasingly augmenting traditional financial news media with social media in order to make investment decisions,” the report says. A research conducted by Greenwich Associates found that in 2014, one third of institutional investors made an investment decision based on information collected from social media platforms. Respondents are turning to social media mainly to read timely news or industry updates (48%), research specific industries information (47%) and seek opinions or commentary on markets and/or events (44%). US-based brands still dominate the social media realm with Blackrock/iShares, Vanguard Group, Charles Schwab Investment, Fidelity Investments, Franklin Templeton Investment and T.Rowe Price ranking at the top of the list. However, European players are progressing. In 2016, the top ten asset managers include three European firms: Schroders, Robeco and Aberdeen AM. Featured image: Social media apps by Twin Design, via Shutterstock.com. Banks are Still Using Decade Old Core Banking Systems – Why are They so Behind the Digital Age?